Customers who need to print high volumes of labels from 5 mm up to 116 mm wide will find a perfect solution in the easy to calibrate, rugged, industrial BP PR+ 200 dpi. The printer’s high-speed processor enables fast printing of high precision labels and is protected by a metal casing. 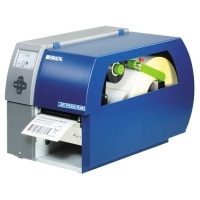 Accessories such as a label rewinder and label cutter can easily be added. The BP PR+ 200 dpi can also easily be integrated in production lines. The Brady Workstation Basic Software Suite is included with every printer, all you need to do is download it on Workstation.BradyID.com/Free.